On January 27, we hosted our first Parenting Spotlight. As the youth and children’s pastors, we wanted to help equip parents in their task of parenting. In our first meeting, we discussed behavior challenges and social media. For those who missed, here are some highlights from each. Social media is here to stay. That being said, social media opens up a variety of issues and complexities to the lives of teenagers, and as long as that is delayed, so are those specific issues—social media related anxiety and depression, cyberbullying, etc. If social media has already been introduced, consider how you can minimize and delay social media’s impact in your teen’s life. TVs, computers, tablets, and phones are much less dangerous when they are not used in the privacy of a bedroom. This allows you to keep better tabs on their use. This is especially important at night. Keep all technology in a charging location—a good spot for this is in the parent’s bedroom. While your teen is becoming more independent by the day and requires more privacy, this doesn’t have to apply to social media. Stalk your kids—meaning, read through their texts, know all their login information, frequently go through their apps, and whatever social media you’ve allowed (Facebook, Instagram, etc.). It’s a good idea to be on those platforms as well. A good tool for this is a smartphone contract. This lets your teenager know the expectation you have for them beforehand. You can introduce a smartphone contract at any time—you’re paying the bill, aren’t you? You can find contracts already made up for you online. While it is good to try to keep as good of a handle as you can on your teen’s social media—the reality is there is so much content going on, that it can be overwhelming, if not discouraging! It is important to remember that you are an imperfect parent bringing up an imperfect child. What is most important is they have a relationship with Christ and that they are growing in that relationship. This has to be the focus over everything else. The second part of our study dealt with teaching your kids appropriate behavior. 1. Exodus 20:12 tells us to honor our father and mother. In too many instances we have “His majesty the Child.” We have the God-given authority to raise them in the way they should go. We need to be there for them and help them by using our authority to step out and try new adventures. Some will work and some will not, but if you help the child know you are there to give your strength, more things will be possible. 2. We learned that God created boys and girls to be different. a. A boy does better with strict and authoritarian discipline. It helps with social-cognitive skills. Boys don’t understand induction until around 15.
c. 1 - A warning is issued and explained. 2 – See a and b above. 3 - Time out, one minute for each year of age. Make sure you set a timer for the time out. This makes the timer the punishment and keeps you from folding or waiting too long. If they disobey the time out, the time starts over. Also, find a place where they do not want to serve the time like the kitchen table. There will be times that you will have to address an issue quicker and you will need to skip steps. 3. Ron Hunter gives us the four “C’s” of a parent’s life. a. Caregiver is about 0-4. It is in this part that basic needs need to be met. You are to provide everything. b. Cop is from 5-10. You are patrolling who they are with, watching what they are doing, and investigating their friends’ parents to see who might have influence on your child’s life. How they act at five is often how they act at 15, so will there be tears and fits at 15? Yes, if you wanted to be their friend and did not deal with it at 5.
c. Coach is 15-18 (High school). They need to know how to fail, they need to know how to drive, they need to know how to date in a safe place. When they are 18, society will take the helping away from you. Colleges will not even speak to parents about financial aid once the child turns 18. Are they ready? d. Consultant is 18 and up. They often want your input, but now the parent must be asked by the child for input. If the parent inserts too much, they will not be asked the next time. 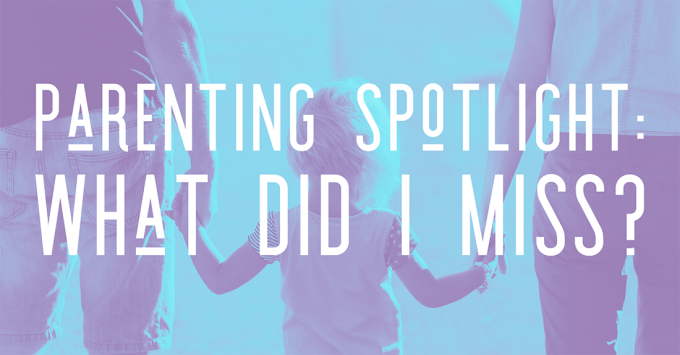 Our next Parenting Spotlight will be on May 5. If there are particular topics you’d like discussed, feel free to let us know ( ). In the meantime, be on the lookout for emails with resources and information reviewing and building upon our last meeting!